Want a good dark cup of coffee because you're feeling tired? Need a jolt of Caffeine? Don't get the dark roast then, you will need more grounds than usual. It's backwards. The darker roasts like an Espresso Roast or a French Roast have a much stronger flavor than the lighter "American style" roasts. On the other hand, the American Style roasts have much more caffeine in them even if they are harsher and more bitter. There is a reason for it. Basic Science. Ok, don't switch off on me now, I won't throw numbers at you. You see the longer your roast your beans, the hotter the beans get. The hotter the beans get, the more likely the caffeine will break down. The flavor you love in the coffee is really the flavor of the sugars breaking down, the coffee oil getting forced out, and the basic "roasting" of the bean. Caffeine is bitter, so if you actually like that taste, you will have a harsher brew. The picture is "Green Coffee". It was 1/3 regular beans, 2/3 decaf beans. Completely unroasted. It's what people call "White Coffee" when brewed. Not an unpleasant taste, a bit grassy, but the result? That "Third Caff" coffee was probably the strongest coffee I have ever had, and that includes the syrup that they call Cafe Cubano here. It was like Mr Sandman stood behind me pounding my head with a giant rubber squeaky mallet and screaming in my ears "WAKE UP!!!!". Get the picture? It was pure jet fuel. So I decided to take it back a step. I roasted this lighter brown brew that you see in the jar. Next to it is my regular dark roast in a spoon. The science content for a fellow roaster is simple. I stopped roasting the lighter coffee at First Crack, the darker roast was at Second Crack. Coffee being a solid bean will crack twice during roast. 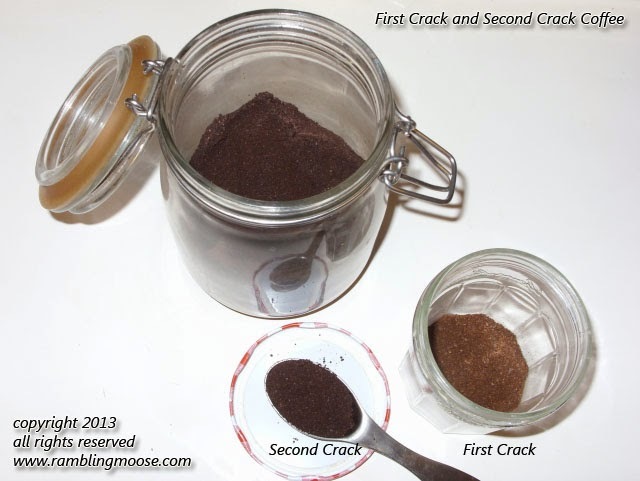 The Second Crack is what you get in a better coffee house since it's got a full and complex flavor, smooth as silk. First Crack is what your parents drank - bitter but chock full of caffeine. First Crack coffee has a much less complex flavor because the coffee oils have not been "forced out" of the beans yet. A Second Crack coffee will have a sheen of oil on the outside promising full and "Balanced" flavor. This is what I send to friends and I always get reports back how smooth and wonderful it tastes. I'm used to drinking Third Caff coffee. 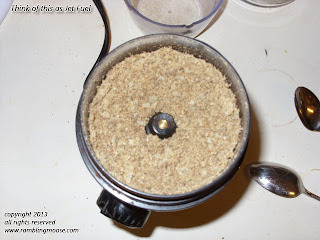 When I tried some of the First Crack coffee, it was a bitter experience, and I felt that Jolt of coffee right away. Even in Third Caff, I felt the difference. The thought I had was that since First Crack American Style coffee takes so much less time to roast, they had to do it in order to make more and lower costs at the expense of a better brew. Naughty, Naughty Roasters. Be ashamed. So the rule is Darker is Tastier but weaker coffee. If you really need to wake up, I suggest getting to bed an hour later and having the darker coffee since life is too short to drink "bad" coffee. If you'll excuse me, all this talking about Roast Times and Caffeine has me wanting some Espresso. Just remember not to pack the grounds too tightly or you'll get a sour brew. The grounds need room to "breathe" but that's a story for a different day. Oh and it will be Decaf. Yes, Decaf Espresso. I see you over there, smirking. Don't judge me, you don't want to see someone as tall as I am bouncing off walls, it isn't as entertaining as you might think. You do want to see that? Not today my friend, not today.